LET THE PROFESSIONAL TAKE CARE OF YOUR NISSAN AUTOMOTIVES! ASE CERTIFIED MECHANICS *** 15 YEARS EXPERIENCE (NISSAN OLDER CARS). CALL TODAY AND LET US SERVICE OR REPAIR YOUR NISSAN! *****WE ARE OFFERING $50.00 OFF TOW FOR REPAIRS OVER $500.00 CALL 702-689-1945 AND SAVE MONEY! ****WE OFFER HONEST AND PROFESSIONAL QUALITY AUTO SERVICE! ****WE OFFER LOW, LOW RATES AND PRICES! ****WE LEAVE YOU DRIVING AWAY FEELING SATISFACTION GUARANTEED! 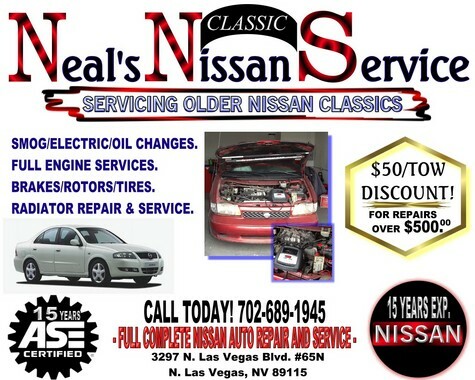 ****CALL TODAY 702-689-1945 AND SAVE AT NEAL’S NISSAN SERVICE. (N. LAS VEGAS, NV 89115) SERVICING EVERYONE! *WE CHECK YOUR FUEL INJECTOR CLEANING. *WE ROTATE TIRES AND CHECK YOUR ENGINE LIGHT. *COMPLETE NISSAN AUTO SERVICE CHECK. *COMPLETE AUTO CARE FOR CARS AND TRUCKS AND MORE! Keywords: nissan classic service, nissan brake service, older nissan cars, nissan computer diagnostics, old nissan parts and service, cheap nissan oil change, nissan cars, affordable nissan trucks, nissan suv's, nissan 1990, nissan motor, older nissan motors, nissan services, nissan parts, nissan parts and service, nissan trucks, nissan classics, nissan motor, nissan tires, nissan engine litght, cheap auto service, cheap nissan cars, low nissan rates, low nissan mileage.